TEL AVIV, Israel — (BUSINESS WIRE) — December 10, 2018 — Vayyar Imaging, the global leader in 3D radar imaging technology, today announced the launch of its new mmWave Evaluation Kit (EVK), Walabot-60Ghz. Walabot-60Ghz provides users with the groundbreaking capabilities of Vayyar’s high-resolution 3D imaging chip, alongside an SDK/API, facilitating rapid development, integration and scaling of products. 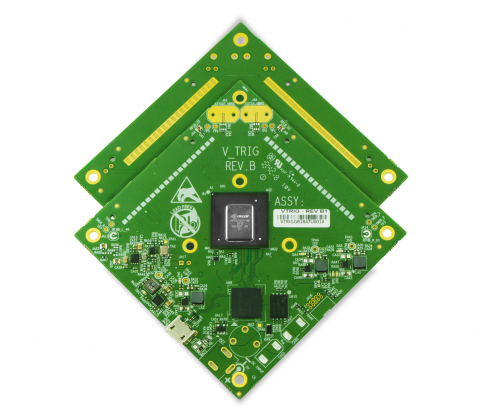 The kit includes a highly advanced chip with a 40 Transceivers array (40 Tx/Rx), complete with FOV embedded antennas and wide-band 60 GHz imaging radar. Click here to see how the Walabot-60Ghz EVK works. The Walabot-60Ghz EVK delivers an exceptionally wide field of view along with high-resolution imaging. This gives users unprecedented capabilities, enabling the development of advanced applications for smart home, robotics, retail, medical and many other industries. Potential uses include obstacle avoidance, perimeter protection, ultrasonic replacement, automatic door openers, people tracking, posture detection, short range imaging and even point cloud technologies. Leveraging the technological advancements of the Walabot-60Ghz EVK, individuals and organizations alike – from research and innovation centers to engineers and enthusiasts – can create disruptive applications based on Vayyar’s advanced System on a Chip (SoC) for mmWave 3D imaging technology. Learn more about the Walabot-60Ghz EVK here. To see the Walabot-60Ghz EVK live in action, visit the Vayyar booth #42161 at CES 2019 January 8-11 in Las Vegas. Click here to set a time to meet with us at CES. Vayyar Imaging is changing global markets with its cutting-edge 3D imaging sensor technology. Its elite, proprietary sensors quickly and easily look into objects or any defined volume and detect even the slightest anomalies and movements to bring highly sophisticated imaging capabilities to users’ fingertips. Utilizing a state-of-the-art embedded chip and advanced imaging algorithms, Vayyar’s mission is to help people worldwide improve their health, safety and quality of life using mobile, low-cost, and safe 3D imaging sensors. Visit www.vayyar.com to learn more.